The serving members of the branch are currently working on the programme for our celebrations of a century of photography in the navy and the RNPA will be offered limited places to attend the day. Portsmouth Is the chosen location to hold the event. It will be on Saturday 21st September 2019. Your committee are meeting to discuss this years plans for our centenary reunion in early March and we will send an email out sometime during the month.More details to follow. Want to know more on how to fill out your own Personal Profile? Click the title above the picture, or the picture and it will take you to the page so that you can complete it. We want to know all about your past history (or at least as much as you're willing to tell us!) so please go and complete your own background history as you want to share. Lots of very interesting information can be found in the archive. Our Historian has worked hard to get the information on the photographs and documents as accurate as possible. But, if you spot any mistakes, he would appreciate it if you send him an email with the 'correction'. If there are any photos or documents you'd like to copy they can be downloaded to your own hard drive. Please let us know if you intend to go along to his send off. We are trying to help the family with some idea of the numbers who will be going. The Association had a wonderful reunion down in Gus over the weekend of Friday 12th to Sunday 14th October. The two pictures were taken by Danny Du Feu as we left the boat on the Sunday afternoon after a great three hours around Plymouth Sound and the Dockyard areas. Lovely food, lots of laughter and great company! 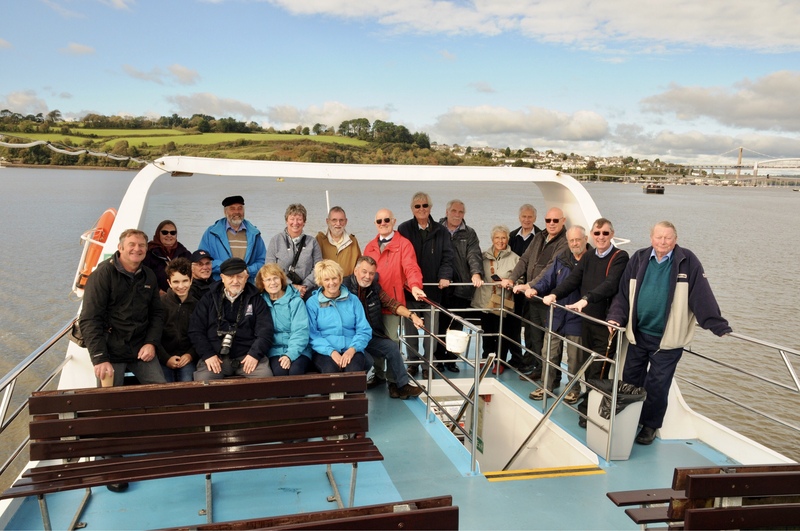 Those who went on the boat trip around Plymouth Sound and the Dockyard as we left to return to our hotel. Photograph of members who on the upper deck of the boat. On Sunday 14th October 2018 we received news that Andy Sinclair had crossed the bar that day. Andy was born on 12th April 1949, so he didn’t manage to make his 70th birthday. Andy lived in Hastings, Sussex, and I will do my best to represent the Association at his sending off party and will post the details of his funeral here, once I know them. 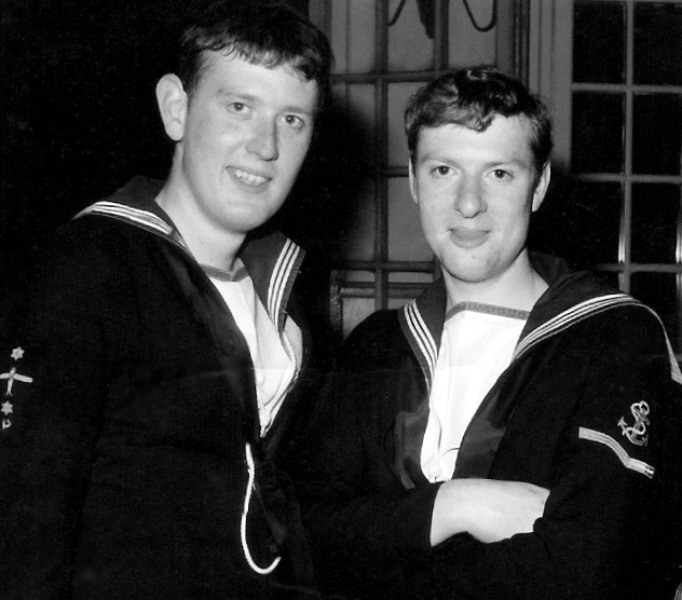 Andy with his brother John. Andy and myself were on the same Phot 2’s course that commenced in October 1965. He was then 16 years old and had joined the branch following in his brother John’s footsteps. 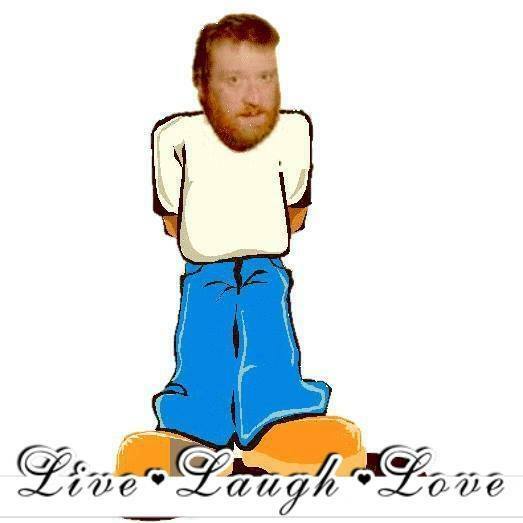 I’m sure that many of you will have memories of Andy, so please share them with us. The photograph: Pete with Angela and friends at Chatham Dockyard reunion in October 2015. On the left is Bridget Bunting with husband Peter behind her; Doreen Larcombe (laughing at Pete!) Angela, Pete’s wife, and Val Darbyshire. At the Chatham reunion he was the life and soul of the reunion. “Monday 5th November 2018 at Northaw Village Church, (St. Thomas’s) at 10.45am. Then I and the family will take Peter to Enfield Crematorium for the Committal. In the meantime, all you good people who would like to join us will go to the Brookmans Park Golf Club, for refreshments, where I and the family will rejoin you at approximately 1.0 pm. Monkey World Ape Rescue, in Dorset. Peter and I adopted a chimp many years ago, and he’s loved the place ever since, and it was always his wish that any donations would go there. I’ll be only too pleased to send all the cheques off in one lot if that’s what you’d like, or of course, you can send your donations individually. Many of you will have worked with Russ during your own time in the branch. Sadly we have to report that Russ crossed the bar on Friday 2nd February 2018, aged 76. He hadn’t been very well for some time and died in his sleep. There was a Requiem Mass at St Joseph RC Church, Goldenhill, High Street Stoke on Trent, ST6 5RD on Monday 26th February at 1.15 pm prior to a private committal service. Donations preferred to CAFOD (Catholic Agency For Overseas Development) C/O the funeral director., Dolven Funeral Services, 31 – 33 Congleton Road, Biddulph, Stoke on Trent ST8 6DY. Russ was in the branch throughout the sixties and the seventies and ended his career as a Chief Phot. Russ’s family put up their own bereavement piece in the Stoke Sentinal newspaper and you can read more here on a notice place in the newspaper. When he left the navy he settled in Talke, just outside Stoke-on-Trent. Russ was highly regarded and I’m sure those who knew him will mourn his loss. When we have more information we will publish it in the next newsletter and also on the website. We’ve received very sad news that one of our members, Mike McKnight, crossed the bar on Monday 19th February 2018. Mike served in the branch for many years and attended a number of our reunions. In spite of his declining health in recent times his good humour was always evident. A few years ago he and Janet had moved to live in Shropshire and they had settled there very well. Mike passed away in a hospice in Shropshire and Janet, his loving wife, was with him at the end. We will let members know more about Mike’s career in the Photographic branch on the website and in the newsletter in due course. See them by clicking on the link, or go to the menu bar and click on Peregrine Trophy Awards and move down to 2016 Gallery. You can enlarge them too by clicking on the bottom right corner icon. A group of our members attended the Peregrine Trophy Awards. We will be putting up photographs and the other details up in the next couple of weeks. 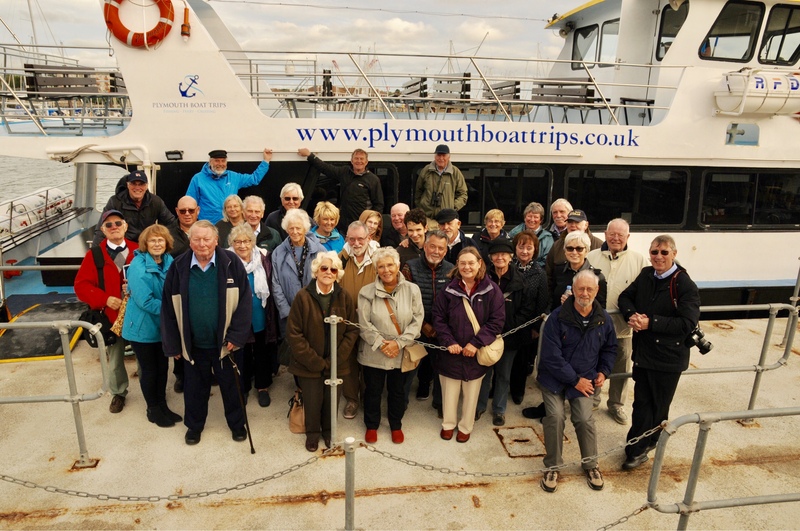 Those attending were: Paul and Sue Parrack, Ray and Pam Whitehouse, Jan and Doreen Larcombe, Brian Jackson, Pete and Bridget Bunting, Val and Tony Darbyshire, Paul and Sheila Hopley, Mike and Jean Keeling and Steve and Hilary King. The reunion over the second weekend in October 2015 at the Royal Historic Dockyard in Chatham has now become a ‘past social event’. By clicking on ‘Social Events’ on the main menu bar there is now a link to this event to reflect that it’s now history! Other changes include the update on the Planned Social Events page which now gives brief details of what is being planned for our next reunion over the weekend of 30th Sept. to 2nd October 2016. Not a lot of content there at the moment but Ray intends to give out more details during the first quarter of 2016. Also, the photographs on the home page for ‘Social Events’, ‘Personal Details’ and Days Gone By’ have been changed. Finally, a new gallery of photographs taken over the Chatham reunion weekend has been added. Just click on the ‘Gallery’ tab on the main menu bar, scroll down and you will find the new pictures. On the left hand side bar in the Royal Navy links we’ve added a link to the wrens.org.uk website. Membership of their Association costs £12.50pa or £90 for a ten year subscription.